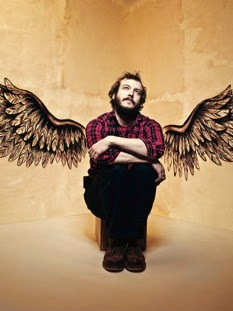 Great interview & review of Bon Iver's Justin Vernon in last week's New Yorker. It's an exceptionally written piece. I'm becoming a huge fan of Sasha Frere-Jones. Below is a quotes that caught my eye. Truthfully though, the last paragraph is magical, I just didn't want to spoil the ride for you. In the dark space of Bowery Ballroom—a room that is not small—it felt like several hundred of us were sitting in Vernon’s head. The intimacy of his songs was matched by a focussed performance that collapsed the space around us. And then, after the demanding and cathartic “Skinny Love,” Vernon retuned his guitar and chatted us up, saying, “How are you guys?,” as if he’d pulled up in his truck to help us move a few pieces of furniture. That personality—“a pretty present person” is how he put it to me—only makes it easier to open up to the music. Here is a video interview on New Yorker's site of Vernon and here is the song, The Wolves that the article talks about at the end. For good measure, I'm throwing in Re: Stacks, another one of my favorites.